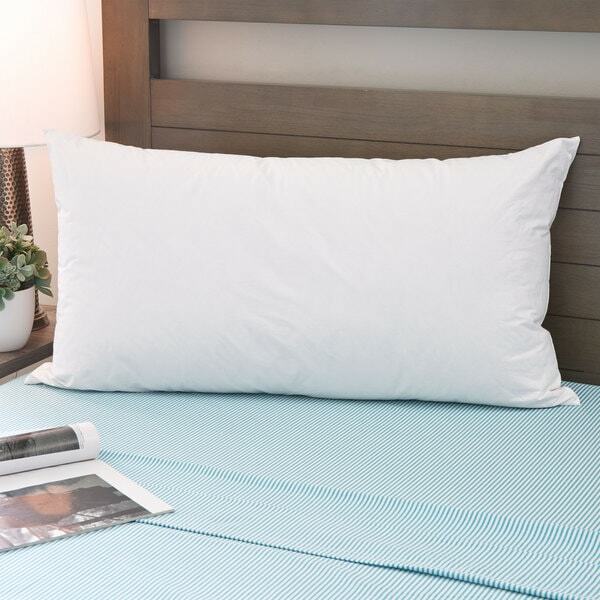 The Sleep Protection down alternative pillow set is filled with an innovative synthetic fiber blend which has the look and feel of down, yet is easier to care for as it is machine washable. A luxurious firmness offers support and comfort for a night's rest you've dreamed of. Additionally, Sleep Protection pillows utilize MicronOne fabric technology, creating a clean barrier between you and potential microtoxins that build up naturally over time in every pillow. The innovative fabric in the pillows block pesky micro-toxins, like dust mites, mold spore, pollen, bed bugs, and even pet dander for those who enjoy cuddling up next to their cat or dog. This luxurious set of pillows comes in Standard, Queen, and King, so they'll make the perfect addition to any room in your home. You'll love your new set of pillows because they offer superior comfort, breathability, durability and health benefits. Enjoy the added peace of mind knowing your pillow keeps you and your family protected. Get the sound sleep you and your family deserve. Love these pillows! They don't flatten too much, and they are super soft, like sleeping on clouds. I've noticed a small amount of bunching up of the filling upon washing, but it doesn't seem to affect the feel, so it's no big deal. Absolutely the best set of pillows I've ever purchased! They're not too soft and not too firm. They're just right. My husband loves them! Will buy 2 more sets! Perfect for my bed and I have terrible allergies so hard to find alternative pillows! Comfortable, easy-care pillows. Order came promptly, and met our needs. We needed hypoallergenic pillows that would be easier to clean and maintain than our other pillows. Pillows look good, sleeps comfortably. These pillows are a good price, and they are comfortable- I really hope they hold up long term. In my opinion, they are firm and soft at the same time. Quality is good for the money and would like these pillows better if they were more firm. Very soft and comfortable just not my preference, have to ball up to get support I need. Theses pillows are so soft and comfortable !!! The first night that I lay my head on it, I ended up waking up late for work lol Its very soft and I am hopping that I last a long time. Perfect pillow! They appear quite thick but still are are very comfortable. Feels like a real down pillow. Very comfortable. This pillows are excellent quality for the price. I find them to be just the right thickness and very comfortable. I’m very happy with them and would re-purchase. Looks to be a good blend of price and features. "I need to purchase 160 sets of the Sleep Protection MicronOne Basic Down Alternative Pillows (Set of 2). Is that possible?" Hello trobertson, please contact Overstock Customer Care at 1-800-The-BIG-O (843-2446). Please let us know if you have additional questions. Thanks for shopping with us.